The winery is completely dedicated to the wine world. The fourteenth century tower, emblem of the historic cellar of the family, dedicated entirely to the reception, it overlooks the adjacent park. The winery is in an excellent location, situated in the village of Pila, very close by of Perugia city (10 mins), Assisi (25 mins) and other places of great historical and geographical importance of our beautiful region, Umbria (Gubbio , Spello, Spoleto, Montefalco...). - Cellar Tour with explanation of winemaking process, bottling and aging. - Wine tasting (generally, we select two white wines and two red wines, a sweet wine and a selection of grappa (spirits), with a “Grand finale” of Brandy, aged 20 years old) accompanied by typical Umbrian: bruschetta prepared with homemade bread and local extra virgin olive oil produced on our site, the local “torta al testo” (typical product) filled with meats or vegetables, a selection of cheese with honey and balsamic dressing, a local “cake of cheese” (pizza under request) etc... as a dessert cookies with almonds paired with our production of Vin Santo and local chocolate. This program can be changed, upon request, based on the needs of the visitors. The visits will be organized during the whole week (including weekends or at any time with a slight price increase). 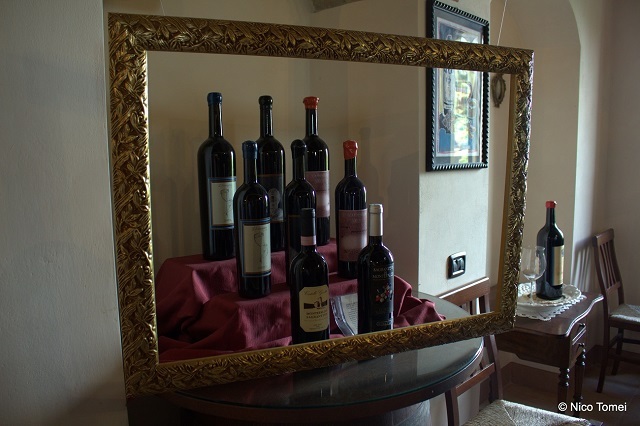 The tasting will take place, depending on the climatic conditions at the park, adjacent to the winery, or in the "Marcella Room", alternately in one of the halls of the Tower, from the XII century.